Sweet Charity, the 1966 musical by Cy Coleman is based on Federico Fellini’s Notti di Cabiria from 1957. 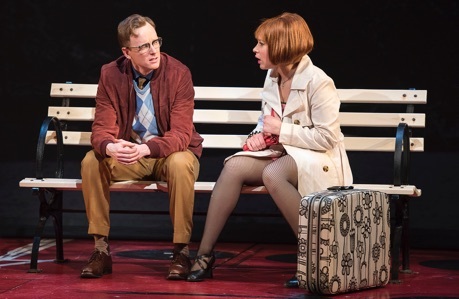 The mere fact that a playwright like Neil Simon wrote the book of the musical helps explain one of the many reasons why the musical is less complex, less brutal and less powerful than the film. The current Shaw Festival production does nothing to ease these problems and, in fact, creates some of its own. 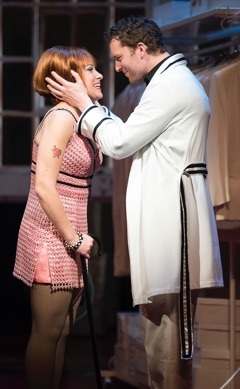 While the work survives as a star vehicle for the performer in the title role, the musical as a whole, at least in this production, comes off as unsatisfying. In the film, Fellini’s wife, the 46-year-old Giulietta Masina plays Cabiria, a prostitute who in her search for romantic love continually falls for men who take advantage of her. The first one robs her and pushes her in a river leaving her to drown. The next is a movie star who takes her as his date simply to enrage his difficult girlfriend, but when the girlfriend arrives at his villa he pushes Cabiria into a closet. After she is caught up in a religious procession, she meets a third man, unlike the others, who gives food to the poor. The fourth man, Oscar, who sees her take part in a vaudeville act where she is humiliated, marries her, but shortly thereafter she realizes that he intends to kill her and steal her money. two never marry. In the musical any thoughts of theft or murder have been erased from his character. The world of the musical has thus been considerably softened from the harsh world of the film. To heighten the comedy, Simon nearly takes the show off-track by writing two scenes that satirize the Sixties and do nothing to further plot or character development. The first is set inside a fancy club where the rich hipsters of the day are shown to be a set of self-obsessed poseurs. The second, replacing the authentic religious scene in the film, is set in the meeting place of a fraudulent hippie leader preaching peace, love and marijuana. The Shaw Festival production further undermines the poignancy of the story through its oddly youthful casting. The Festival has cast the talented, immensely likeable Julie Martell as Charity. No matter her real age, she looks and acts as if she were only 25. The problem with this is that the blow Charity suffers at the end of the musical has much less impact if we think Charity is still at the beginning of life rather than in mid-life as is Giulietta Masina in Fellini’s film. If Charity is played as middle-aged, we think of Oscar as perhaps her very last chance at finding happiness. Simon’s text for the musical mentions that the taxi dancers of the Fan-Dango Ballroom are of all ages. That’s why there is a scene with the young newcomer Betsy, who immediately gets a “date” before anyone else. That’s why Charity and her friends Helene and Nicky sing the song “There’s Gotta Be Something Better” about their hope of not spending their lives as taxi dancers as do some of the girls at the Fan-Dango. Yet, as far as we can tell on stage, all of the taxi dancers are young and alluring. The youthful casting (it is the first season at the Shaw for ten of the cast members) means we don’t feel the threat of being sucked into the life of taxi-dancing as we should and we don’t feel the urgency behind Charity’s relationship with Oscar as we should. If Neil Simon has considerably lightened up his source material, director Morris Panych lightens the tone even more. He begins the show with Sixties-style movie credits, a technique he seems to love but becomes more tiresome every time he uses it. The show is not a movie (that’s why we came) so why pretend it is? Any time a scene could stand a more ambiguous interpretation, as when Charity is dumped (literally) by her first “boyfriend”, Panych goes for the more superficial response. The worst example is the very final scene of the musical where he has Charity get over the worst experience of her life in the space of a few minutes. Charity is a romantic and seems to bounce back after every bad situation, but without some sense of poignancy the story loses its depth. Panych compares Charity to Don Quixote in his Director’s Notes, but brings out none of the ambiguity of that great character in Charity. If we set aside the fact that she seems far too young for the role, Julie Martell still gives a terrific performance. It’s the most complex role she’s ever played and she rises completely to the challenge. Her voice has only gained in strength and colour over the years. She is great at verbal and physical comedy. And when a scene calls for powerful emotions, she has them ready to hand. She is so good that one only wishes Panych had asked more of her, such as mingling comedy with pathos, because we feel she not only could do it but wants to do it. As Oscar, Kyle Blair also gives a wider-ranging performance that he’s had a chance to before. He moves from the very funny young man trying to hide his claustrophobia the the stalled elevator for Charity to a tortured soul forced to confess to Charity his own weak nature in the vain hope she will not think him a cad. For a performer who is such a fine singer and dancer, it is a pity the show allows him only one song and no dancing. Mark Uhre makes a strong impression as Vittorio Vidal, the Italian movie star who uses Charity as his substitute date. He makes high comedy out of the narcissistic character’s vain attempt to forget the woman he threw off. His voice is as lush as always and as with Blair, it is a pity the show allows him only one song. Among the many subsidiary characters, Kimberley Rampersad as Nicky is a clear stand-out. Not only is she a superb dancer with a rich singing voice, she is also a fine actor who finds more nuance in Simon’s dialogue than anyone else. Melanie Phillipson is consistently amusing as Nicky and Charity’s friend Helene, who has the same gift for dry delivery as Lisa Horner. Jeremy Carver-James radiates charisma as the bogus preacher Daddy Brubeck and Jacqueline Thair plays Ursula, Vittorio’s rejected starlet bimbo with flair. Because Sweet Charity was first directed and choreographed by Bob Fosse it has been known as a dance musical. Parker Esse, choreographer for this production, is simplly not as inventive. His best scene is the “Rich Man’s Frug” set inside a club for wealthy hipsters where his stylized Sixties dance movements perfectly suit Charlotte Dean’s outré black-and-white costumes. Otherwise, as in “There’s Gotta Be Something Better”, he seems unable to thinks of anything interesting for for three females dancers to do on an empty stage except for a selection of standard jazz dance routines. Sweet Charity is already a problematic musical in its attempt to sanitize a cinematic masterpiece for the Broadway stage. Morris Panych’s superficial direction and Parker Esse’s unimaginative choreography do nothing to help reclaim what little pathos is left in the musical adaption. Since the musical is not revived all that often, fans of music theatre and fans of Julie Martell will not want to miss it. Theatre-goers indifferent to music theatre will not find that Sweet Charity changes their opinion. Fans of Fellini will find the musical a betrayal of the film. When, however, a Sweet Charity comes along in the future with a Julie Martell who can convincing play a 46-year-old woman and when she has a director who realizes how rich the character of Charity can be, that will be a production everyone will want to see. Photo: Melanie Phillipson, Julie Martell and Kimberley Rampersad; Julie Martell and Mark Uhre; Kyle Blair and Julie Martell. ©2015 Emily Cooper.